Timeless elegance at the High Line and West 25th Street. 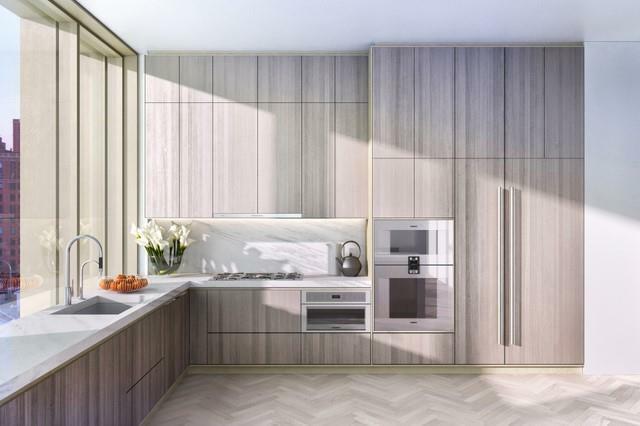 A limited collection of seven floor-through three bedroom loft residences and The Duplex Penthouse in the heart of West Chelsea.The 4th floor of 500W25 is a blend of understated grandeur with the tactile sensibility of modern minimalism. This full floor, 3 bedroom, 3 bathroom corner loft residence celebrates beauty, sophistication, and functionality, all in equal measure. Simple lines, exceptional materials, and impeccable craftsmanship define the 2,152 SF interior. Exemplary indoor-outdoor living at its finest, the fourth floor offers a full width, 35' long private 210 SF western terrace, with ample space for lounging and dining. The home will be delivered with up to 10-6 ceilings throughout and an astonishing 140 linear feet of windows. Every room enjoys a view of The High Line. The layout of this home is delicately balanced. A keyed elevator opens into a spacious private foyer that separates living and entertaining spaces from the three bedrooms, allowing for as much or as little privacy as desired. Wide plank white oak flooring, artfully placed in a herringbone pattern, accentuates the 23 long by 16 wide corner living and dining room which is bathed in natural light through floor-to-ceiling windows. A custom designed windowed kitchen is appointed with white oak cabinetry, hand selected natural stone countertops and Gaggenau appliances, all of which integrate seamlessly into the contemporary aesthetic. The gracious master suite is delivered with impressive scale and is the definition of a private oasis in downtown Manhattan. This exquisite corner bedroom is filled with light from cleverly positioned floor to ceiling windows slightly angled toward The High Line. Enjoy private access from your master bedroom on to your terrace through large French doors. 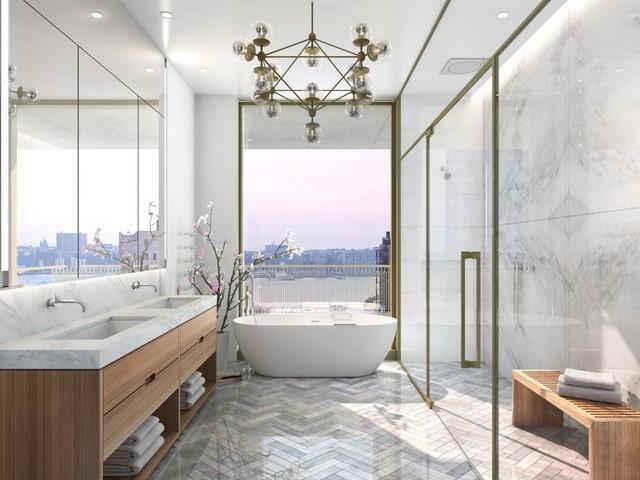 The master bathroom features an oversized walk-in shower with a full height book-matched marble accent wall, freestanding deep soaking bathtub and radiant heated marble floors. Two additional north facing bedrooms, each with their own en-suite marble bath and ample closet space, complete this residence. Side by side washer and dryer have been discreetly tucked away off the foyer. 500W25 will be delivered in a handsome Alabama limestone faade and is located at the corner of West 25th Street and 10th Avenue. 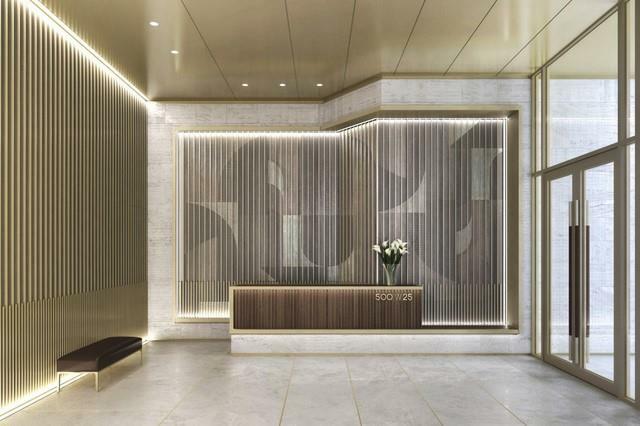 The building features a doorman and a stunning lobby adorned in a custom wood and brass mosaic with a 15 ceiling. 500W25 is perfectly positioned in the West Chelsea gallery district, home to more than 350 art galleries. 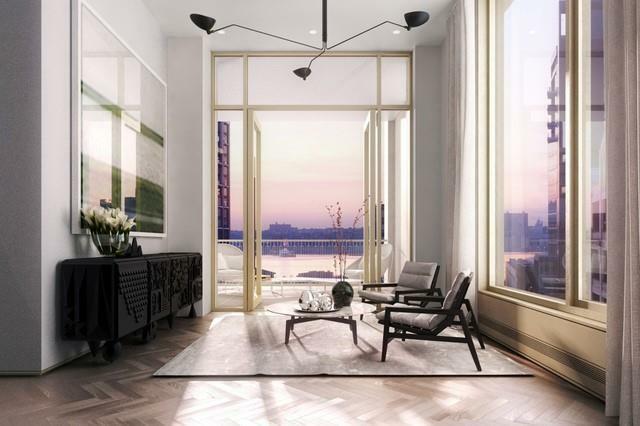 From this location you are moments away from the Meatpacking District and Chelsea Market to the South, the newly built Hudson Yards to the North with easy access to Chelsea Piers. 500W25 is immediately adjacent to The High Line, an internationally celebrated and award-winning public park.500W25 has a custom quality that touches every element of the design. From the form of the building to the material palette and finishing details, every choice is deliberate, and every selection has been considered in light of past, present, and future. EQUAL HOUSING OPPORTUNITY. THE COMPLETE TERMS OF THE OFFERING ARE SET FORTH IN THE OFFERING PLAN AVAILABLE FROM SPONSOR, 500W25TH OWNER LLC, 12-16 VESTRY STREET, 7TH FLOOR, NEW YORK, NY 10013, FILE NO. CD18-0065. SPONSOR RESERVES THE RIGHT TO MAKE CHANGES IN ACCORDANCE WITH THE TERMS OF THE OFFERING PLAN. THE ARTIST REPRESENTATIONS AND INTERIOR DECORATIONS, FINISHES, APPLIANCES AND FURNISHINGS ARE PROVIDED FOR ILLUSTRATIVE PURPOSES ONLY. SPONSOR MAKES NO REPRESENTATIONS OR WARRANTIES EXCEPT AS MAY BE SET FORTH IN THE OFFERING PLAN. Listing courtesy of Josh Doyle of Compass.